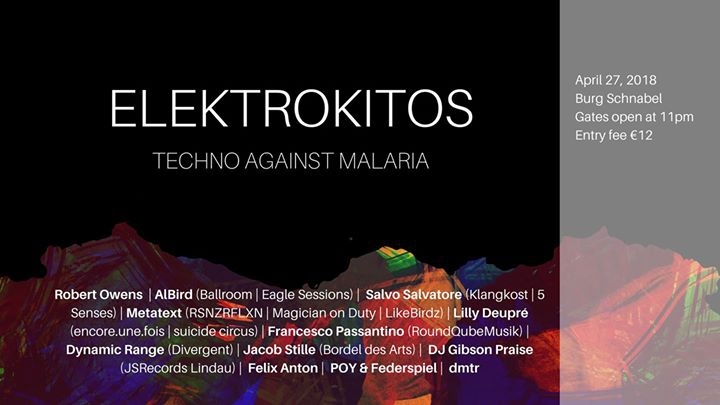 ELEKTROKITOS – Techno against Malaria! On 27th April, Burg Schnabel opens its doors for the Charity Party ELEKTROKITOS. Let’s dance the night away together! The event is organised by the Hope Foundation e.V. and takes place during the annual Malaria Week Berlin. Even though Malaria is highly curable, it is still one of the deadliest infection diseases worldwide. Every year half a million people die from Malaria worldwide, from which 90% of the cases occur in Africa. The lack of awareness and access to prevention methods are the main reasons for the high mortality rate. The main vector are mosquitos. Insecticide-treated mosquito nets have been proven to be the most effective measure against malaria. That's why together with organising information campaigns in Cameroon, we distribute free mosquito nets to the population at risk in rural Cameroon. All the proceeds of Elektrokitos go towards our 'Malaria Free Cameroon' project.